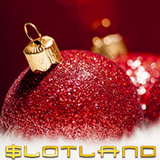 We could all use a little extra cash this time of year and lucky for us Slotland has lots of bonuses available over Christmas including a no-deposit bonus and a match bonus with the lowest wagering requirement ever. A $10, $20 or $30 no-deposit bonus is coming to players in this month’s newsletter. This weekend get up to 45% added to all your deposits. Then over Christmas, December 23 to 25, use redeem code XMAS2014 to claim up to three more casino bonuses getting (50%, 70% and 100%). 30% bonuses on all deposits made December 26 to 28 have an incredibly low 1X wagering requirement. Slotland has 34 real money online slot games but the new Gods of Egypt is the most popular right now.Treasure Island has also seen a lot of action since a player hit a $207,008 jackpot on that game just a few weeks ago. Ice Queen, based on the classic fairy tale, is always popular at this time of year as well.